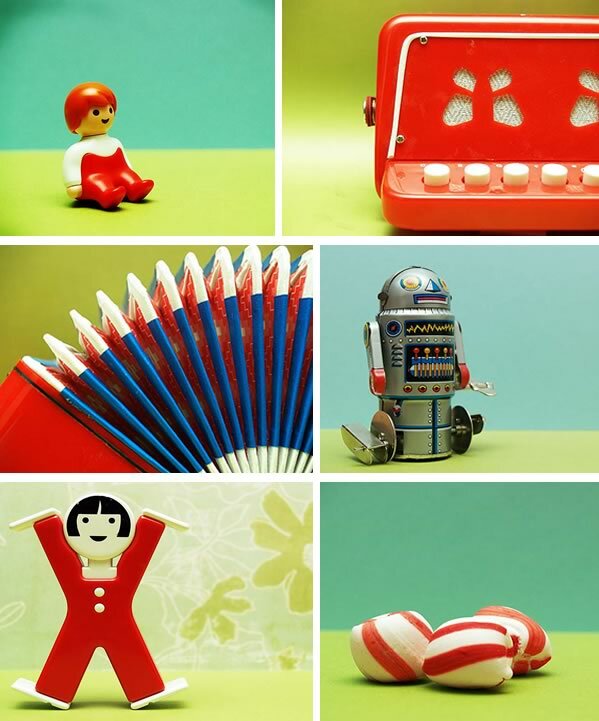 With all this talk lately on color, I found some perfect examples of fully saturated hues in this quirky cute photography experiment on color that was conducted by blogger Moki. Her photos are absolutely stunning - vivid, clean, excellent composition, and truly a feast for the eyes. If you're trying to train your eye and develop a stronger color sense, why not pull out your digital camera and just start snapping photos of color combinations that you like. Capture things you like at random, when you're out and about. Snap photos in your home. You can certainly feel free to set up your own home photo shoot and experiment like Moki did using old toys, fabric, art, magazines, etc. You'll need a place to keep your images, so after you've selected your favorites, open a free flickr account and upload them, building your very own online color portfolio. Over time, you'll not only build a fantastic image collection, but you'll start to see a pattern in what colors dazzle you the most AND most of all, what combinations of colors (color schemes) do you tend to gravitate towards. Outside of learning, building an online color portfolio is just plain fun, and you can share it with other peeps in various flickr groups with a similiar color fixation. Try it!